Why was the new KPI dashboard added to the Bill4Time platform? The new KPI dashboard builds upon our Bill4Time legacy dashboard, which focused on quick access and at-a-glance metrics. Based on user feedback, we learned that our clients really appreciated having at-a-glance totals. 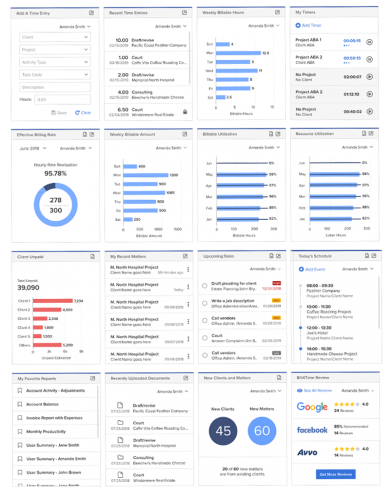 As we developed the new dashboard, we focused on bringing key information and business insights to the surface, so that users could quickly see the information they needed, when they needed it. Bill4Time has many levels of complexity (in our billing, invoicing, reports features as well as the newer legal practice management features that we’ve added) and a variety of different users with different needs. It was essential that we made the central dashboard as useful and functional as possible for the specific needs of each individual user of the platform. We’ve made the dashboard the home of new information and most recent information for anyone in the firm, no matter their role. This real time functionality is increasingly essential for small firms who are so focused on their practice and serving their clients that sometimes these reporting and analytics tasks can fall to the wayside. With this new redesign, we’ve taken a step towards automating the accessibility of this information and performance metrics so that when users add data to the system (like adding a time entry), they can see the outputs in real-time and visualize how it impacts their firm. This efficiency of the dashboard will be an advantage over some bigger law firms that can take a multiple day turn-around time to accurately produce the same metrics and reports. What is a KPI and why might it be important to a solo, small or mid-sized law firm? A KPI is a Key Performance Indicator. KPIs are metrics and benchmarks an attorney can use to measure their performance and overall health of their practice. An example KPI metrics could be as simple as tracking how many new clients you have brought on, or how many hours you have billed on a certain day. In practice, these metrics can assist partners, attorneys, and managers to evaluate their efficiencies, successes, and practice areas prime for improvement on both an individual and firm-wide level. What’s the adoption level of tracking KPI metrics for modern firms? Over the past decade, KPI tracking has trickled down from Big Law to mid-sized and smaller law firms. Particularly in the context of the proliferation of cloud computing software throughout the industry, firms are able to automate these reporting functions and gain invaluable business insights from the data. No longer does it take a day or two of time spent sifting through excel spreadsheets to find the metrics that you’re searching for. Bill4Time has a history of robust and comprehensive reporting. Many of these metrics already existed on one of myriad reports, available to our users to run, depending on how frequently they wanted to analyze that metric. So what we’ve done on our new dashboard is surfaced and automated that at the top of the platform. Now users can see the most up to date information without having to run a report or shepardize their data in order to make sure that it’s accurate. Who in the firm will be using the KPI dashboard and how will they be used? Who uses the various metrics cards will depend on the persona of the user when interacting with Bill4Time. We see everyone from paralegals, associates, to managing partners and bookkeepers, all types of different roles using the platform. The beauty of the dashboard in its customizability, is it’s truly built for everyone. Whether you’re tracking your own performance as a solo or your own performance as someone who is part of a larger firm, you’re able to visualize how you are doing, but you can also toggle to different users. 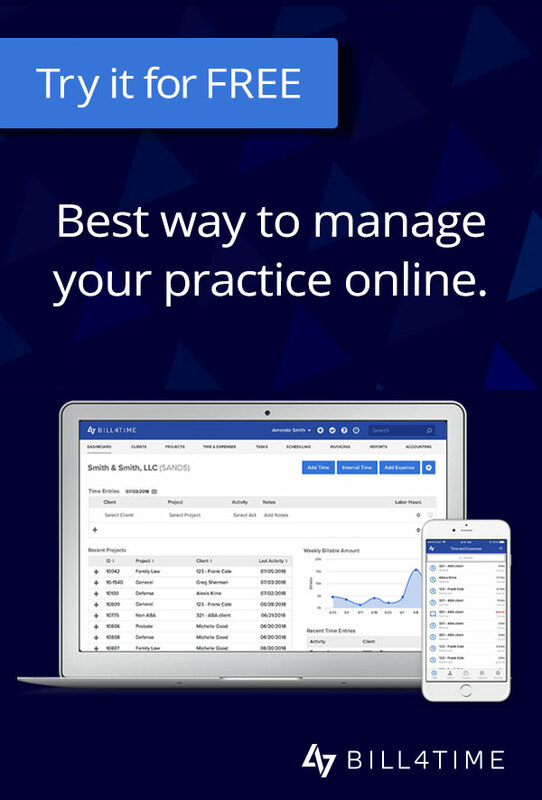 If you’re the manager of a practice group, you would be able to see how each of your associates are performing. Not only are you able to track individual metrics, we also have a variety of cards that allow you to track firm wide metrics. 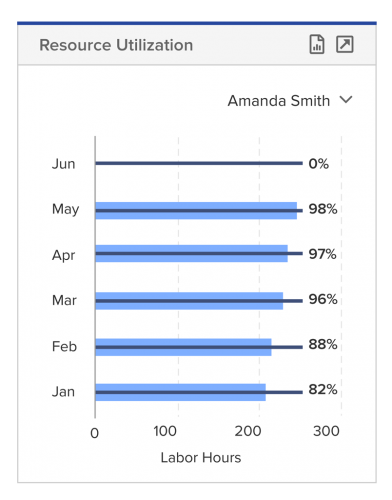 Now you can design your dashboard to incorporate a mix of KPIs on the individual and firm-wide level to fit your needs whether you’re a solo or a managing partner. How can someone set up and customize their dashboard to start tracking performance? 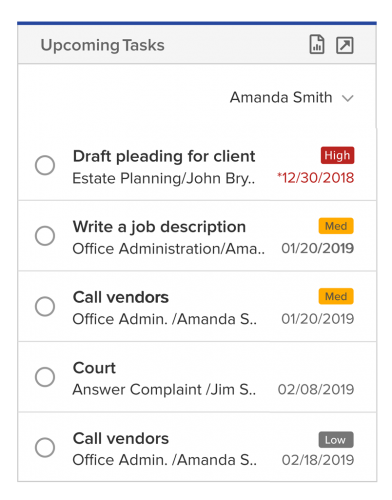 At the heart of the dashboard is going to be basic data entry cards (e.g., creating time entries, marking certain tasks complete) and easy access informational cards (i.e. recently worked on clients and matters). Now, if one were to add a time entry directly on the dashboard time entry card, the rest of the associated dashboard cards (e.g., recent time entries, weekly billable hours, weekly billable amounts) will update automatically in real time. Having that reactivity means that in each instance a time entry is saved to the program, you get an immediate update to keep tabs on your progress. In the event that you had a typo with your entered hours, the dashboard with surface that mistake immediately which would allow you to correct it and update it right away. Say that you have a report that you run pretty frequently in your daily routine. Maybe you want to see payments that came in this month. You can set up your dashboard so you can see your most recently incoming payments with just a single click. The same functionality and quick access exists for your recent documents. For example, if you have recently created a folder for a client, you can click on the folder on the dashboard document card, and it will instantly bring you to the folder in the system. When you’re working on a matter and you upload a new file, it will populate on the recent documents card and be readily available (which is valuable and saves you time since you might need to return to it in the near future). From user feedback, we learned that having that quick access really streamlines data entry and improves efficiencies. More often than not, when someone is creating an entry for a matter, they are actually creating multiple entries as they’re tracking their time contemporaneously. So being able to quickly go back and add another time entry or maybe to add an expense, surfaces those quick click actions that our users have become accustomed to. Let’s say a managing partner, who oversees a group of associates, wants to be able to track and stay on top of that user’s productivity. Any of the cards available on the dashboard can be recreated multiple times for each attorney. For example, the managing partner could easily customize and line up the Weekly Billable Amounts cards or Most Recent Time Entry cards for all of their individual associates along the dashboard for easy comparison and assessment. Alternatively, the managing partner could utilize only the one card, but toggle the individual data with a click. Note: For more sensitive data, some firms might not want all of their associates to have access to certain cards, reports, etc. Users can implement the same system permissions restrictions on the dashboard that would govern other data across the platform. For example, if a user is not able to see client balances on the accounting tab, they would also not be able to see client balances on the dashboard card. The effective billing rate and utilization cards were the most popular metrics we discovered across our user base when interviewing our clients. Resource utilization is the portion of firm-related work hours that have occurred in a given month, and Billiable utilization is the percentage of billable hours, that’s client-related billable time, that the user has tracked in a given month. These metrics are differentiated from activities that might be related to marketing, recruiting or training which are firm related work, but aren’t necessarily billable towards the client. 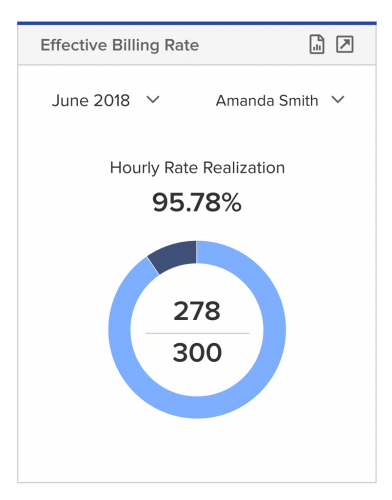 So whether you’re a grinder, putting in all of those billable hours, or a finder prospecting new clients, you’re still able to track your utilization of work towards the firm on your Bill4Time dashboard. And each individual attorney is able to set these targeted amounts within their profile. We find that many attorneys end up working, 140, 160, 180 hours even (we understand how crazy attorney hours can be! ), but the billable hours can sometime be slightly less, which allows individuals to track these two unique targets a little bit differently. As hours are entered into the system, these cards will be updated against their targeted monthly goals. So if an associate has hit their billable targets earlier in the month, they can now more effectively manage and plan to use their available hours in the final week of the month. They can schedule some dedicated firm related tasks (like recruitment or prospecting) to make sure they reach their resource utilization target goal. Especially, coming down from Big Law, there are clear billable hours targets that an associate are expected to perform each year, solos are also competitive. While not against a class of associates, they’re competitive against themselves. Solos want to set a benchmark for their own performance and meet it. Whether it’s a hard benchmark or not, they still want to compete against the benchmark that they’ve set for themselves. The feature card also has built in flexibility. So if you’re taking vacation one month, you will be able to drop down your billable hours in an effort to account for the time out of office, when tracking these metrics. The effective billing rate essentially calculates how much of your billing rate you actually bill for. This is an important KPI, because it indicates whether or not your hourly services are priced right in the market. If you’re regularly hitting over 95% of your effective billing rate, it might be time for you to increase your billing rate, claim a little bit more revenue and potentially profit by having that increase. If your effective billing rate is a little lower, say 75%, this is an indicator that there’s a problem with your method of billing or maybe that you’re priced too high in the market. If you end up writing down a lot of your time, or lowering your rate, or writing off bills entirely, due to an unsatisfied client engagement, you would see that percentage of the realization rate drop and can really be a lagging indicator of whether the user has good time tracking habits and ultimately good billing and collection habits. Effective billing rate is one of the most important KPIs to track, and it’s also one of the most difficult to manually calculate (which highlights the value of having it automatically generated for you on your dashboard). This card saves users the time of hand cranking your spreadsheets and making calculations on your own to something that updates in real time. So you’d hope by the end of the month, you’re pretty close to that 100% rate, and if not, that might give you pause to look back and see what factors may be affecting your performance. If you have a solo attorney, small, or mid-sized firm, these law firm metrics will impact the bottom line of your entire business. Whereas if you have an attorney who is trying to make partner, trying to move up in the firm, they’re going to be able to use these cards to show their value to the managing partner. Each user can customize their dashboard and make it their own, focusing on time entries or firm wide metrics, everyone at any sized firm will benefit from the personalization of the platform. Whether you’re operating on your own, or tactically working with a team, you can use these metrics and various other cards through your own design, so that you’re surfacing the information that’s most pertinent to you.